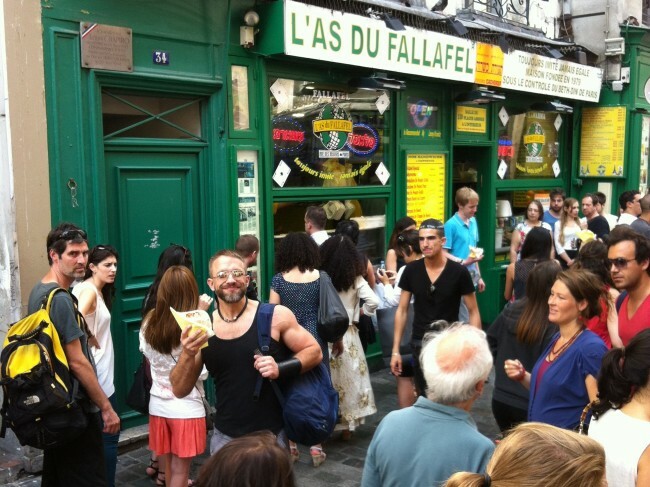 One of our favorite streets in Paris was Rue des Rosiers in the Marais, home to two of the most of the most amazing food stands (in our opinion) in the city: L’As du Fallafel (literally “The Ace of Falafel”) and La Droguerie du Marais (“The Marais Drugstore”). On more than one occasion we feasted on one of the amazing falafel pitas — made with eggplant and julienned red cabbage — and followed it up with a banana-and-Nutella crepe. Heaven. Here’s a video of the crepe master at La Droguerie doing his stuff… and Dirk and I reaping the rewards. I love how the guy slices the bananas without even looking! Also, below are couple of pics of us L’As du Fallafel. I’m still full. I was in Paris many years ago and so remember the good food. The croissants with freshly made butter were to die for…twice. I thought I wouldn’t like it but their idea of a roast beef sandwich with coleslaw on it but it was also great. Have a great and pleasant stay in Paris for you ! There was an article in the NYTimes the other day about how the little French eateries so beloved by Americans are now actually buying pre-prepared foods and microwaving them. Sacre bleu! !